Ghangad FortHeight : 3000 ft.
Ghangad is situated on western side of Mulshi River, which is called as Korbarase Maval. 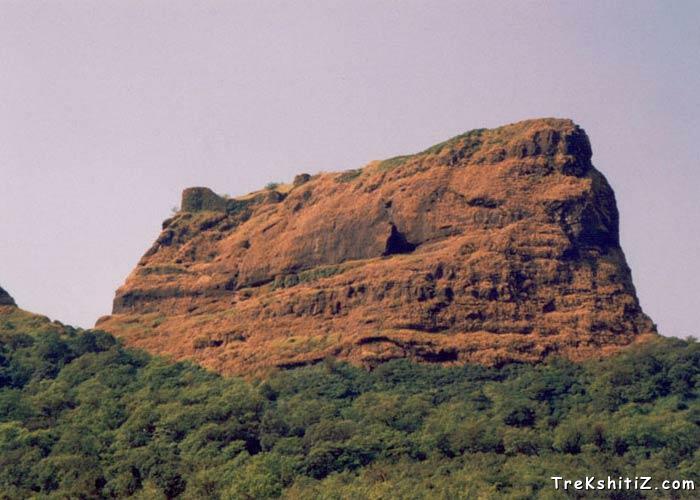 This fort is surrounded by Korigad, Telbaila and Sudhagad, but still lonely and separated. One can reach the fort by a path from left of the fort. As you enter from the devastated structure of big entrance, you can see some remnants of old palaces along with some water tanks which are now in very bad condition. You can see Sudhagad, Sarasgad and wall of Tailbaila from the fort, also Nandand Ghat, Savvashincha Ghat and Bhorpaychi Nal, which descend to Konkan. There is only one way from Ekole village which takes you to the fort. Firstly reach Lonavla, and then take a bus to Bhaburde village, which is nearly 40 km away from Lonavla. Then another 20 min. walk from village takes you to the Ekole village. On the way to the fort, you can see a temple of Goddess Garjai. In this temple there is a Shilalekh which says �Shree Garaai Maharajachi and Kille Ghangadachi�. From the left side of this temple, is a way to the fort. Further you will reach to a steep patch of 15 ft. It is advisable to carry long rope to climb it, which will directly take you to the fort. There is no accommodation facility on the fort. But around 20 people can be easily accommodated in the Garjai temple. It will take around half an hour from Ekola village to reach the fort.